On Golden Pond...or Up the Creek! Recruited as the sole in-house designer for MSB Media and 4 sister companies after one year of employment with BookPros. Collaborate with CEO and Marketing Director to maintain high quality and competitive standards and to ensure design projects are on time and within budget. Actively set creative direction, vision and develop creative solutions for 60+ projects a year. Autonomously designed company marketing materials (brochures, catalogs, magazine, ads, logos, etc. ), book covers, and interiors for multiple books/novels. Effectively promote the Austin Toros by coordinating with Game and Business Operations Manager to establish successful marketing solutions. Independently prioritize, plan, organize and control workflow to meet timely deadlines. Conceptualize and design 40+ marketing materials yearly for Austin Toros and occasionally 3 other NBA Developmental Teams. 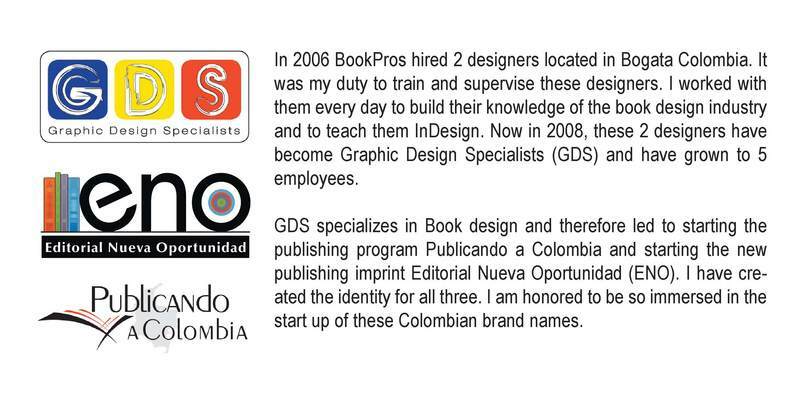 Promoted within 6 months, overseeing design process for all client and internal work for BookPros. Informed clients of market trends and led them in the right direction for achieving maximum sales quality; resulting in 7 best-sellers and 25 awards and finalists. August 2008 Bridgeway Books #1 in Sales! Extensive experience in print design, preparation and production. Proficient in Adobe Photoshop; Illustrator; InDesign, Microsoft Applications, PowerPoint, Acrobat, Distiller. Outstanding interpersonal skills, supportive team player and significant ability to work with all levels of an organization. Unmatchable degree of creativity as well as technical production skills. Strong verbal communication skills including the ability to convey ideas and information clearly, concisely and persuasively. Enthusiastic self-motivated problem solver and conceptual thinker. "I really appreciate your interest in improving the book's whole layout this way. It's very comforting to feel that this complicated project has landed in such dedicated and competent hands." "Thanks Monica, you've been great. I consider the rocky start I had with two horrible designers, which cost me several lost months to say the least, all worth the price to have arrived at your expert help and sophisticated eye. Bravissima!" "Thanks again Monica…you do a great job juggling the expectations and (forever evolving) ideas of your clients and your designers. I’m confident we will end up with a much better result for the revisions we’re doing." "This cover is perfect and exactly what we both wanted to achieve: a strong concept that is consistent with the text and that will grab a buyer's attention. I appreciate your patience and cooperation. Please thank the designer [Monica] as well. She nailed it!" "I am enthused about the revised cover design and want to thank you for the neat way you resolved the problem." "Thanks for your efforts the last couple of weeks. You're a trooper with whom I enjoy working." "Everyone is really going nuts in relation to this cover design, tell your people they really hit a home run on this one!" "Thanks again for your work on this project. You're doing great." "Monica, absolutely fabulous! You guys are great at what you do." "Monica: I enjoyed speaking with you and Amanda last night--I am more excited about the production of this book after hearing your suggestions!" "I appreciate all of you and your team's hard work to make this cover both pleasing to me and to the readers. That can be a tough match!" "Hi Monica, new proofs here, with much more tasteful use of effects. Thanks." Cover Designer for Chicken Soup for the Soul. "Monica, Art of Meaningful Living looks AMAZING. I think Chris and John [the book authors] will be beyond thrilled…seriously, I am super impressed. I want a copy for my very own!" "You are the master of InDesign!" "Thanks for the advice on Cockey's art book. That's really helpful!" "MON. I´m not sure if I did ever tell you this but I want you know how much I really appreciate all that you taught me, I learned so much from your training. I think you are a great designer. I just want you to know how much I appreciate everything you did for me at beginning, well.. I still learn from you a lot so... :-)"
"Monica, you're the best coworker ever. I don't know what I would do without you." "Monica, I just wanted to thank you for being such an outstanding mentor to me during my time at BookPros. I have learned so much from you and I can say without a doubt that I could have never landed a job in design without all of the things you taught me about the creative suite. You made my time at BookPros not only worthwhile but fun and challenging as well. I wish you the best and I'll try to keep in touch!" "Monica, thanks for all your guidance through all the projects, all of your advice - everything! I couldn't have had a better mentor." "Thanks Monica! You've been a great mentor!!"